WASHINGTON (Sputnik) - US authorities have removed the Russian flag from the seized residence of the Consul General in Seattle as the residence has lost its status, and the flag will be returned to the Russian embassy, a spokesperson for the US State Department told Sputnik. On Monday, the Russian Embassy in the United States said in a statement that the US authorities had removed the Russian flag from the seized residence and called this action "unlawful and unacceptable." "In accordance with the Vienna Convention on Consular Relations, the United States withdrew its consent for the establishment and operation of Russia’s consular post in Seattle on April 1, 2018. Since the Consul General’s residence no longer enjoys status as the residence of the head of a consular establishment it would not be appropriate to leave the Russian flag flying there," the spokesperson said. Earlier, Donald Trump ordered the expulsion of 60 Russian diplomats and closure of the Russian Consulate in Seattle over allegations about Moscow's involvement in the poisoning of former Russian intelligence officer Sergei Skripal and his daughter Yulia in UK. Moscow has refuted any involvement in the case, pointing at lack of evidence. The US government had demanded that all Russian personnel leave the property by April 24. 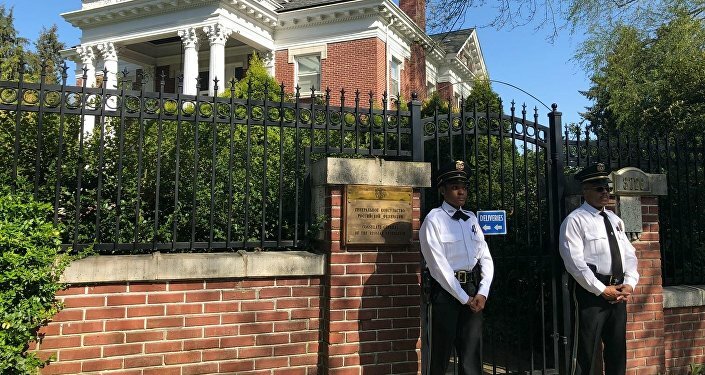 The following day, US officials closed the residence of the Russian Consul General in Seattle by opening the gates and entering the building after breaking all the locks. The State Department claimed the action was legal.